About halfway through last year, I switched to a choice based model of Art Ed or what many call “TAB” or Teaching for Artistic Behavior. This means that the students are in control of what they make, rather than the teacher. If you want more information on this movement, I suggest you check out their website, the yahoo group, TAB-Choice Art Ed and this article by TAB educator, Nan Hathaway (I will warn you, this article has caused controversy, but I think it paints a pretty good picture of why a lot of teachers have switched). I thought about it for about two years before making the jump but now that I have, I really like it. It does however, come with many new challenges. One thing I am working on is that my kids really love the “scribble stage” of studios or basically that point where you experiment and go all out with reckless abandon. Who wouldn’t love that…but this year, I wanted them to start thinking more. Our vision is all about thinking and problem solving. Though experimentation is important, I wanted to push them further. In a conversation with the high school teacher in my district, she brought up that she sometimes uses pre-planning worksheets for her regular projects. She talked about having them do a thumbnail sketch and answer a few questions before getting started. She e-mailed me her template but it wasn’t quite what I was looking for so I started looking around Pinterest and the TAB yahoo group. Finally, I came across this worksheet that was made by Nan, the same woman who wrote the article above. I decided to have students use this before getting started in their choice studio. I also started giving them unit challenges. That way, there would be a plan and a purpose. 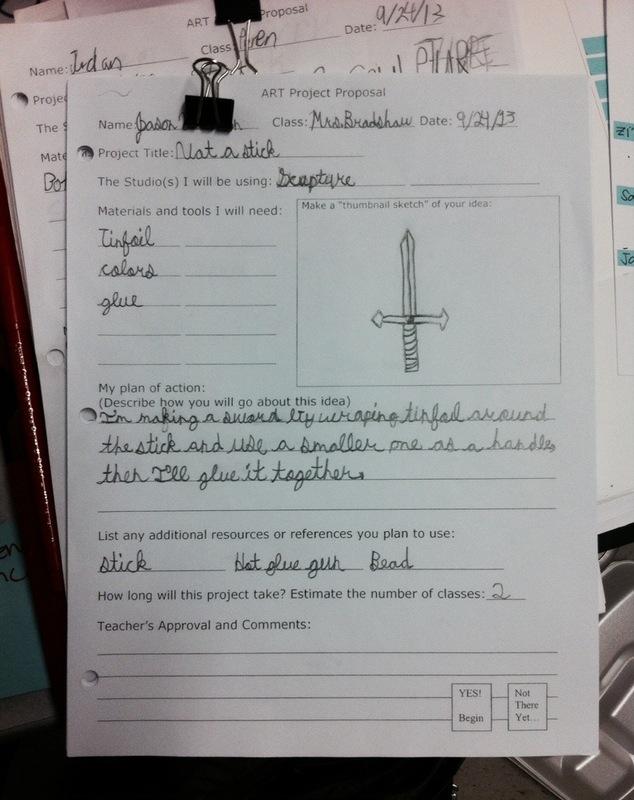 My Unit 1 Challenge was based on the book “Not a Stick” by Antoinette Portis. Last week was the students’ introduction to this new system and, as expected, it was met with mixed reviews. The kids didn’t love the extra paperwork they were being expected to do, but I do think it gave them a bit of an opportunity to think through their work before getting started. Below is an example of a proposal from a sixth grade student. That last part is what I fill out as I look at them to let them know if this is a solid plan or if they need to do some work. He doesn’t have quite everything in the right spot but for his first one, this is pretty good. Not all were quite that thought out, so I want to keep encouraging kids to go into more detail. I think if I were to re-do the sheet myself, I would have them draw their project first, then think about materials, and after that match them to a studio. On this particular sheet, studios come first so I think the kids think about where they like to work rather than what they are making. So, we’ll be having talk about how to choose your studio(s) next time we do it I think or designing projects to fit the studio you want to work in. Also, his idea was one from the book (although, knowing this kid he may have come up with it anyway…) so I also want to be encouraging students to think bigger and with even more of their own investments and personal style in mind. Choice is such a new process to me and there are so many variables, that I think every year will be a bit of an experiment. Hopefully with this method, I am pushing at least most of the kids to put a bit of thought into their work! Just a quick first glimpse into some of the areas of my classroom. I will get a full picture and more details as they are put together!